Officers gather at the terminal in Bishop International Airport. 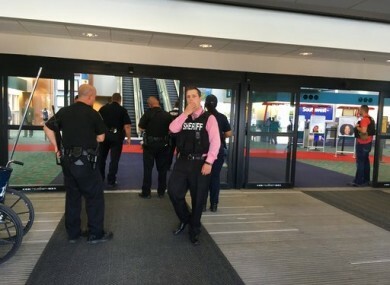 OFFICIALS HAVE EVACUATED an airport in Flint, Michigan, where a witness said he saw an officer bleeding from his neck and a knife nearby on the ground. On Twitter, Michigan State Police say the officer is in critical condition and the FBI was leading the investigation. Local media has identified the officer as Lieutenant Jeff Neville. It is believed that one suspect is in custody. Bishop International Airport posted on Facebook that passengers were safe and were being told to check for flight delays or cancellations. Ken Brown told The Flint Journal he was dropping off his daughter at the airport and saw the officer bleeding from his neck. He says he saw a man detained by police and a knife on the ground. Flint Mayor Karen Weaver said in a statement: ““Right now we are still awaiting more information about the situation at Bishop Airport this morning. Airport and police officials didn’t immediately respond to messages from The Associated Press seeking comment. Flint is about 50 miles northwest of Detroit. Email “Airport evacuated in US after police officer stabbed in the neck”. Feedback on “Airport evacuated in US after police officer stabbed in the neck”.